All children dream to meet Santa Claus, we know it's not very easy to do, but in this game Jaime can not only see but will share a rich Christmas cake with him. We will give you this little hand is very happy to be with Santa Claus, it helps decorate the cake for Christmas dinner. Choose the color you should wear covers two floors of cake. Decorative ribbons and more beautiful for your cake happy to let Santa Claus ornaments. Manages the table for Christmas dinner whose centerpiece will be your great cake. 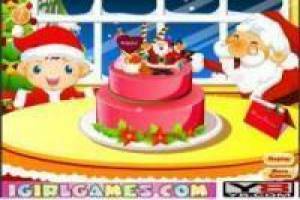 Have fun creating different designs of Christmas cakes. 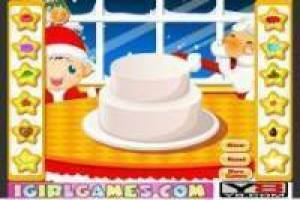 Enjoy the game Creating a fun Christmas cake, it's free, it's one of our decorate games we've selected.